Frame and Wheel is bringing to market a 2010 BH G5 57 cm carbon fiber road frame set on eBay. This frameset was up for auction on eBay in late March, but it failed to reach the reserve price of $1,400. The closing price was $1,325 with 8 bids from 4 bidders over seven days. Frame and Wheel is auctioning this item as a ten day no reserve auction. The frameset was purchased new in April 2010 through a sponsorship arrangement between BH USA and California Pools Dewalt Cycling Team in San Diego, California. The frame was raced for the 2010 season in California and has an estimated 2,000 miles on it. It has never been crashed and it has had only one previous owner. The frame has been in storage as shown since October of 2010. The previous owner is selling the frame because he wants to allocate his resources towards the operation and maintenance of another racing bicycle. This frame features an integrated seat post, a BB30 bottom bracket shell and a recessed channel down the bottom of the down tube to hide cables and provide a mount for a Shimano Di2 battery. The frame was previously built up with Campagnolo components and therefore the sale includes Campagnolo BB30 adapter cups. The bike as shown weighs 4 pounds and 1 ounce (1.8 kg). The serial number is on the bottom of the bottom bracket and reads BI 0016 P10027335300440. There are over 100 detailed pictures of this frame at Frame and Wheel eBay Selling Services and on Facebook at Frame and Wheel. Please take a look. The bicycle is being sold as is. The frame is in very good condition. It is clean and there are no scratches, bubbles or cracks in the frame. There is no wear on the underside of the front fork crown, on the underside of the down tube or on the back of the seat tube. The rear derailleur hanger is straight, there is no corrosion in the bolt holes and the carbon front derailleur hanger is not worn or compromised. Frame and Wheel notes the following: there is a 10mm x 5mm chip in the finish on the non drive side of the bottom bracket, there is a 5mm x 5mm chip in the finish on the drive side of the down tube, just under the word “Global”, there are two chips in the finish of about 4mm x 4mm on the drive side of the chain stay. There is some light abrasion on the sides of the head tube from the cables. There is some wear at the top of the seat mast from seat post collar. There are abrasions from the bolts that mount the brakes to the frame. Frame and Wheel carefully inspected this frame, but cannot guarantee that every imperfection has been spotted. This is a very light and nicely finished frame that features all that is new in high performance road frames: BB30 bottom bracket, integrated seat post, Shimano Di2 compatibility, carbon front derailleur hanger. The frame will suit the taller rider who already has BB30 cranks (or a Campagnolo crankset) and who wants to upgrade to something light. This is a great opportunity to realize some excellent value and to join the growing peleton of BH riders. Steer tube: tapered carbon upper diameter: 1 1/8 inch. Lower diameter: 1 1/2 inch. steer tube length: 26cm (b-t). The frame will be shipped using Federal Express Ground. The box is double thickness. International buyers please contact Frame and Wheel about shipping. Provide city and zip code. International shipping uses UPS Air Freight Consolidated. Please pay by Pay Pal and please pay promptly. 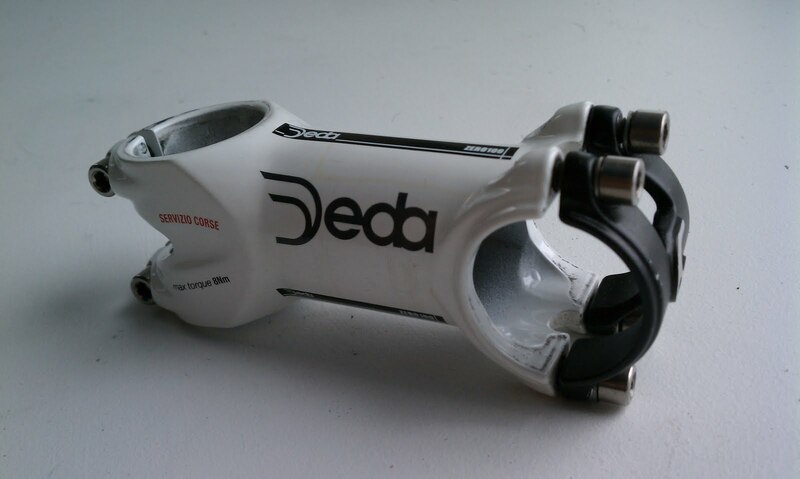 Frame and Wheel is auctioning on eBay a 2010 Deda Zero100 Servizio Corse 80mm alloy stem. The previous owner purchased the stem new at Cyclemania in Portland, Maine earlier this year and installed it on his primary racing bike, but found that it was too short. The stem was switched out after two months of use and has been in storage in its original box ever since. The stem is in good condition. The face plate is not cracked, there is no corrosion in any of the bolts, the screws are not stripped, all the bolts and washers included and there are no major scratches or bends. Frame and wheel notes the following: there are light abrasions around the stem from where a road computer was mounted with zip ties. There are small scratches on the face plate. There are no recalls out for this stem. Frame and Wheel’s view is that this is an excellent opportunity to obtain a very short but very well made stem at a good discount to the retail price. The stem is being sold as is. 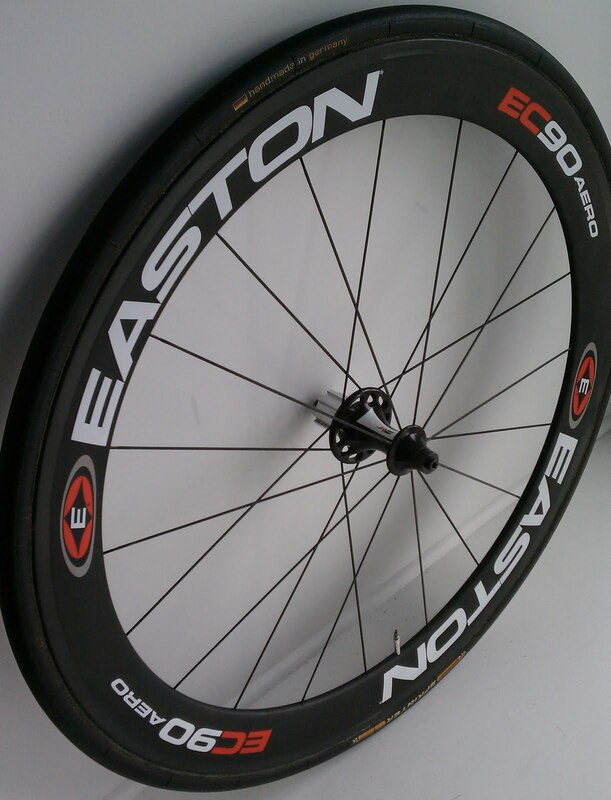 Frame and Wheel is bringing to market a 2010 Easton EC90 Aero carbon tubular rear wheel. The wheel was purchased new at Hi-Tech Bikes in San Diego in April 2010 as part of a promotion for Power Taps. Buyers of an Easton EC90 wheel built up with a Power Tap were offered a standard EC90 rear wheel at a substantial discount as a back up or a race wheel. The only previous owner embraced this promotion, but ended up using this wheel approximately five times. It has never been crashed and it is in very good condition. There are no cracks in the rim and it is true and round. The spokes are tight and straight. The braking surface of the rim is not worn. The bearings are running smoothly. The Continental Sprinter mounted on the rim is very lightly used. firmly glued and holding pressure. Frame and Wheel notes the following: the pawls are a bit loud and are perhaps due for a cleaning. There are some light abrasions on the splines from the cassette. The Continental tire has a 10 mm gash on the drive side of the tire just above the sidewall. Frame and Wheel’s view is that this is a very nice and light wheel that is still capable of rolling many fast hours either on a road bike or on a triathlon bike. It will also make very nice back up tubular until the new owner can obtain an Easton EC90 Aero tubular front wheel and make a wheel set. Includes Continental valve extender. Skewer and cassette not included. The wheel is being sold as is.